As promised, here’s the paneer makhani recipe that I shared at yesterday’s New York Times Cafeteria. Their team did a great job of recreating the recipe. It was a lot of fun to step into their kitchen to be greeted with the smells of an Indian home kitchen with packages of authentic Indian spices littering the counter. We've been wrapping the paneer makhani with fresh basmati rice, yogurt and if you want a salsa of diced onions, cucumbers, tomatoes and green chiles in a large burrito wrap. Spice things up with a dollop of coriander chutney. 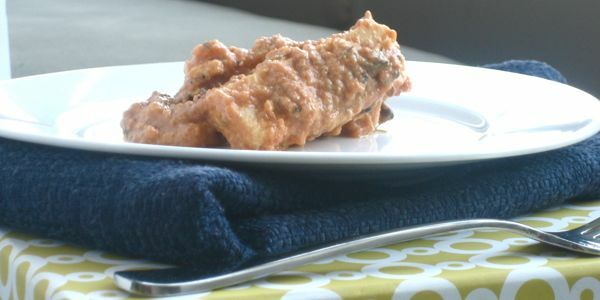 I like to omit all of the extras and just enjoy the spicy-sweet, creamy makhani sauce wrapped with rice and yogurt or simply over a bowl of rice. Quarter tomatoes and puree in a food processor with the green chilis. Add cooking oil to a deep skillet on medium heat. Add ginger -garlic paste and cinnamon stick and cook for about 15-20 seconds. The paste will splatter so keep a lid nearby. Add the tomato-chili puree and cook for about 10 minutes until some liquid has evaporated and oil separates. Stir in all of the spices and the almond butter. Cook for another 8-10 minutes. Fold in the yogurt. Add salt and sugar. Gently add the paneer and stir until well coated. Yumm… Paneer makhani looks delicious. This looks awesome! I’m wondering if I can substitute super firm tofu? (But if I get over to the Indian market I’ll definitely look for the paneer cheese). This sounds divine! I have made paneer with spinach and love it. You don’t have to pre-fry the cheese for this recipe? @Pavani – thanks! It’s quite delicious. I love the spicy and sweet. @KateLynn – If you use tofu, I would get the extra firm and pan fry it before adding it to the sauce. I don’t think unfried tofu will hold up as well as unfried paneer (see my next response). @David – I’ve made this dish both ways – fried paneer and paneer cut up straight from the package into the sauce. Both work well, and for this sauce I almost prefer it fresh. Plus if you skip the frying, it’s so much faster and healthier. If you make a really liquidy curry like Mattar Paneer, I don’t think fresh would work well. Leave me a comment and let me know how it turns out! Nithya-Goodness, that makhani looks divine. Do you make your own paneer or do you buy it? If you buy it, can you recommend a brand/place to get it? Last time I got some at Kalustyan’s but it wasn’t very good. Hi Anne – Thanks! I buy mine from the store 🙂 I usually buy it from Kalustyan’s or Little India (across the street and one block south). My favorite brand is Nanak. They sell a few, which I’ve tried, but have found them to be really hard. Hope that helps! Let me know if you try it out. Looks amazing! Is there anything I could use instead of the almond butter? I have almost everything else on hand except that! Next post: Are “No Substitutions” Policies Ok?